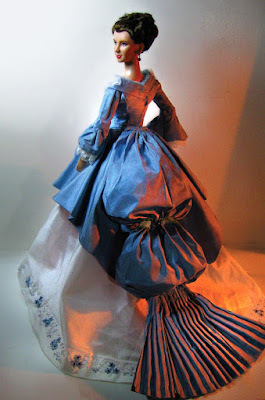 undergarment to give the skirt volume. This undergarment has been fringed with ruffles and is gartered (I'm not sure how to call it) at the waist. 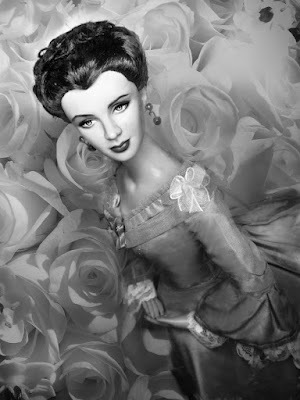 The doll is a basic Tonner Scarlett. Factory paint has been removed and the face repainted and blushed. I can't say I'm a professional repainter but this repaint makes me happy. 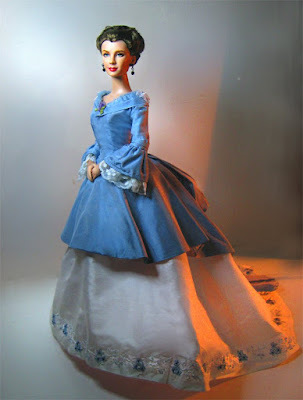 I repainted this doll a long time ago and (in the process of learning new stuff about repainting) repainted again. This time, the tearducts (and what arduous task it was to paint them) had been added, brows softened from the harsh lines of before, lower lashes and lower rim of the eyes have also been retouched. The lips is repainted with crimson red acrylic and accented with darker shades on the sides as well as a even darker shade to separate the upper lip from the lower lip. The eyes are the hardest of all I believe. In those are 4 colors of acrylic layered on top of the other to create depth -- I hope! 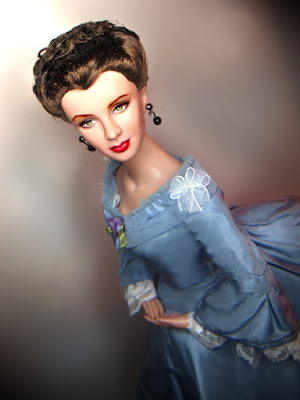 The doll's hair are 4 rolls which have been tied separately then pulled up and trimmed to leave a crown of rolls on the dolls head similar to Scarlett's hairstyle in the end scenes of Gone with the Wind. The hair is set with gel and patted with hairspray. So, here it is. Finally Alana's dress arrived after 3 weeks of waiting -- or was it a month? Thats the hustle part of it. I hope you all like this little creation. 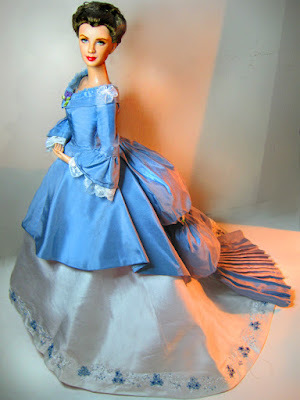 Alana Bennet's site is http://www.dollfashionsbyalana.com She is collaborative and has very reasonable prices. Thank you Alana for making another dress for Scarlett! Alana does amazing work! It really turned out well. What a wonder !! The dress is stunning ! It is a unique and marvelous piece for your scarlett... Who is, as the dress itself, stunning too !! You are at a high level, and all of your patient practising shows in this repainting.